Singletrack Maps makes beautiful maps for mountain bikers in the Crested Butte, Durango, Ft Collins, Lyons, Golden, and Buffalo Creek areas. 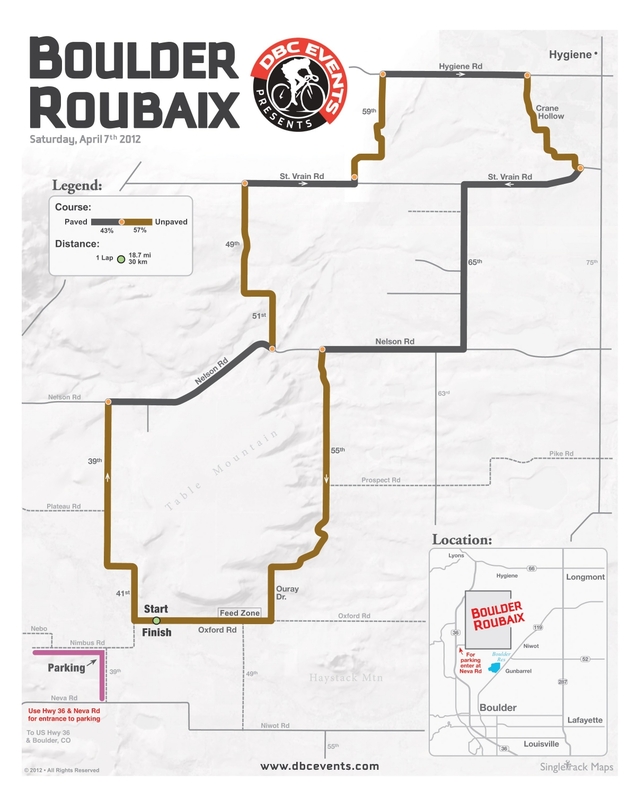 They also make race maps for DBC Events, which organizes and promotes, among others, Boulder Roubaix, Mead Roubaix, and the new Candela’s Circuit Race. If you’ve never ridden a Roubaix style race, or are interested in a classic gravel grinder or even something more extreme, like the rides in the Colorado Endurance Series, this is a great place to start. The 18 mile loop takes in the best parts of northeast Boulder back roads, with a particularly stunning stretch along Crane Holllow Rd. If you don’t live in the Boulder area, this is a good introduction to the mix of gravel and paved roads that make up the the cycling grid in Boulder County and that make the County such a great place to be a cyclist.You’re not likely to be alone up here–all these roads are well-traveled by many cyclists, joggers and walkers. If you are not racing, start this one anywhere. You can ride out from Boulder, park along most of the roads, or find a convenient parking area such as that just west of 39th Street and Neva Rd. There are not a lot of C-stores out here, so it can be handy to pass near your car every loop you make. The loop shown is a an almost even mix of dirt and pavement, with most of the dirt well compacted by the use of magnesium chloride. Ruts, loose gravel, and narrow roads make this an interesting ride. There’s a very detailed description, from a racer’s point of view, of the dirt sections in Russell Harding’s blog, the Road to Cat 1.